As I’m writing up my dissertation (ahh! ), I’ve been geeking out with graphs and statistics (and the beloved/hated stats program R). I thought I’d share a cool little tidbit. Full disclosure: this is just a bit of an expansion on something I posted back in March about how well the camera traps reflect known densities. 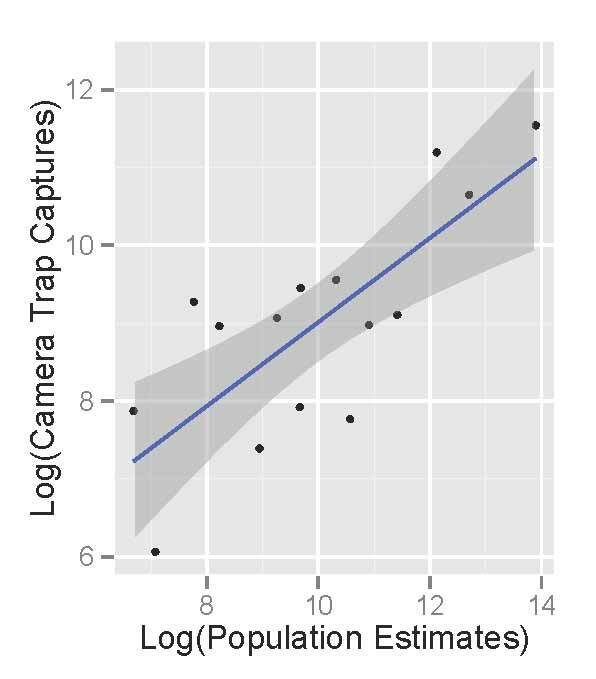 Basically, as camera traps become more popular, researchers are increasingly looking for simple analytical techniques that can allow them to rapidly process data. Using the raw number of photographs or animals counted is pretty straightforward, but is risky because not all animals are equally “detectable”: some animals behave in ways that make them more likely to be seen than other animals. There are a lot of more complex methods out there to deal with these detectability issues, and they work really well — but they are really complex and take a long time to work out. So there’s a fair amount of ongoing debate about whether or not raw capture rates should ever be used even for quick and dirty rapid assessments of an area. 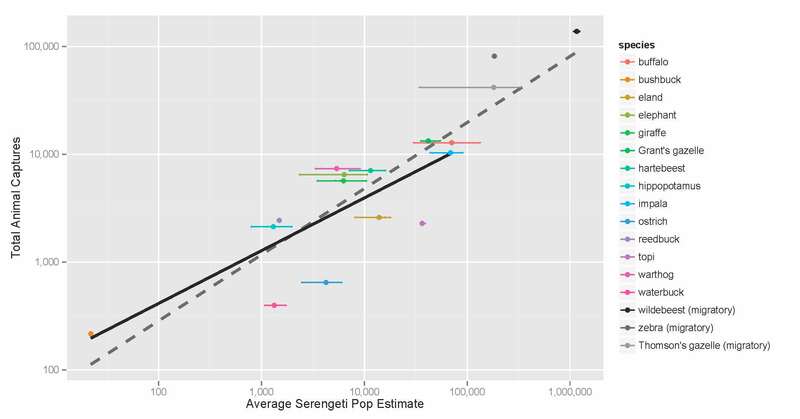 Since the Serengeti has a lot of other long term monitoring, we were able to compare camera trap capture rates (# of photographs weighted by group size) to actual population sizes for 17 different herbivores. Now, it’s not perfect — the “known” population sizes reflect herbivore numbers in the whole park, and we only cover a small fraction of the park. But from the graph below, you’ll see we did pretty well. 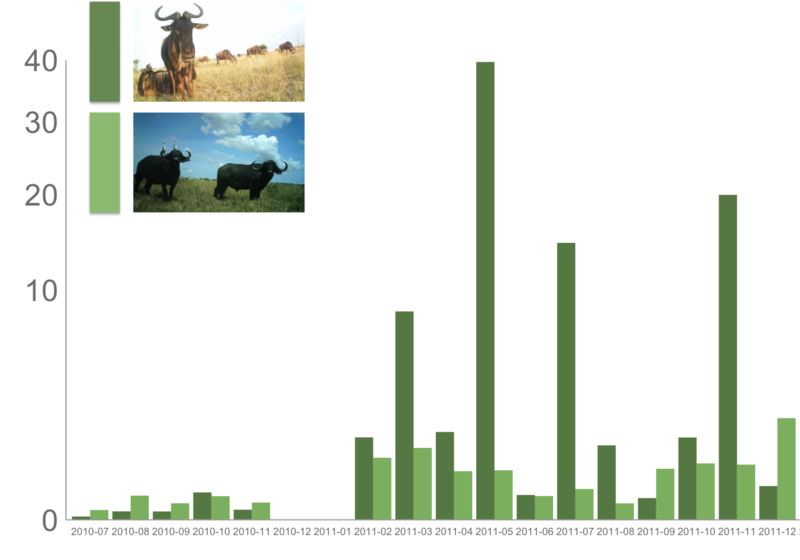 Actual herbivore densities (as estimated from long-term monitoring) are given on the x-axis, and the # photographic captures from our camera survey are on the y-axis. Each species is in a different color (migratory animals are in gray-scale). 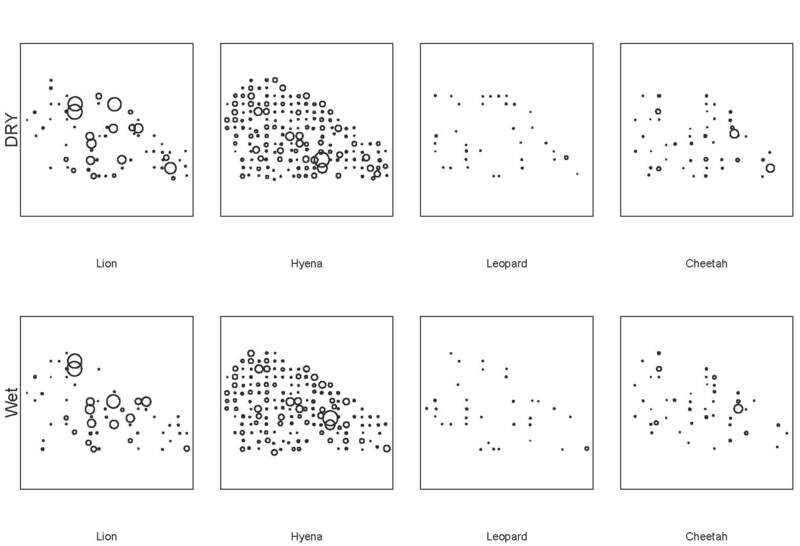 Some of the species had multiple population estimates produced from different monitoring projects — those are represented by all the smaller dots, and connected by a line for each species. We took the average population estimate for each species (bigger dots). We see a very strong positive relationship between our photos and actual population sizes: we get more photos for species that are more abundant. Which is good! Really good! The dashed line shows the relationship between our capture rates and actual densities for all species. 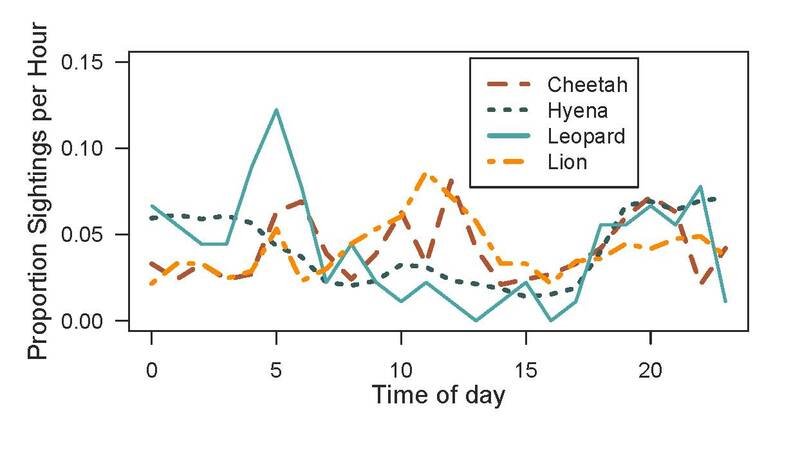 We wanted to make sure, however, that this relationship wasn’t totally dependent on the huge influx of wildebeest and zebra and gazelle — so we ran the same analysis without them. The black line shows that relationship. It’s still there, it’s still strong, and it’s still statistically significant. Now, the relationship isn’t perfect. Some species fall above the line, and some below the line. 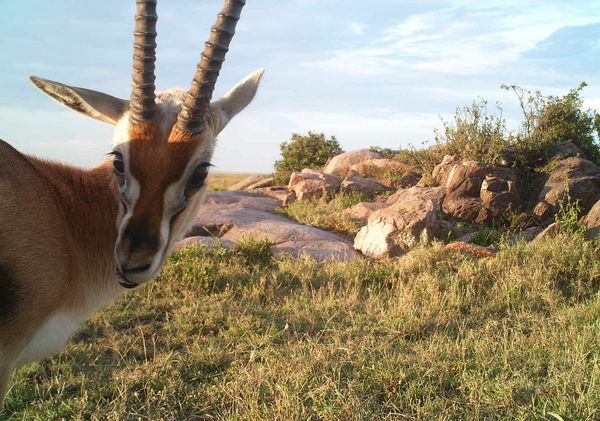 For example, reedbuck and topi fall below the line – meaning that given how many topi really live in Serengeti, we should have gotten more pictures. This might be because topi mostly live in the northern and western parts of Serengeti, so we’re just capturing the edge of their range. And reedbuck? 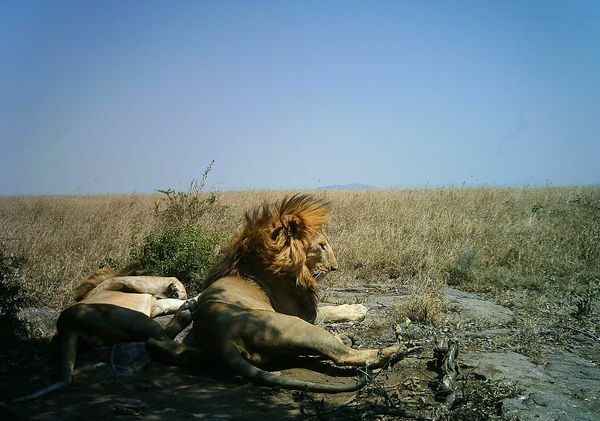 This might be a detectability issue — they tend to hide in thickets and so might not pass in front of cameras as often as animals that wander a little more actively. Ultimately, however, we see that the cameras do a good overall job of catching more photos of more abundant species. Even though it’s not perfect, it seems that raw capture rates give us a pretty good quick look at a system.